I know, I started out the New Year by committing to weekly book reviews. I’m a little behind due to our vacation to the Everglades, which was, by the way, spectacular. But that’s for a future post. Today, however, in honor of the birthday of our sixteenth President, I’m reviewing a particularly poetic book about Abraham Lincoln’s childhood. 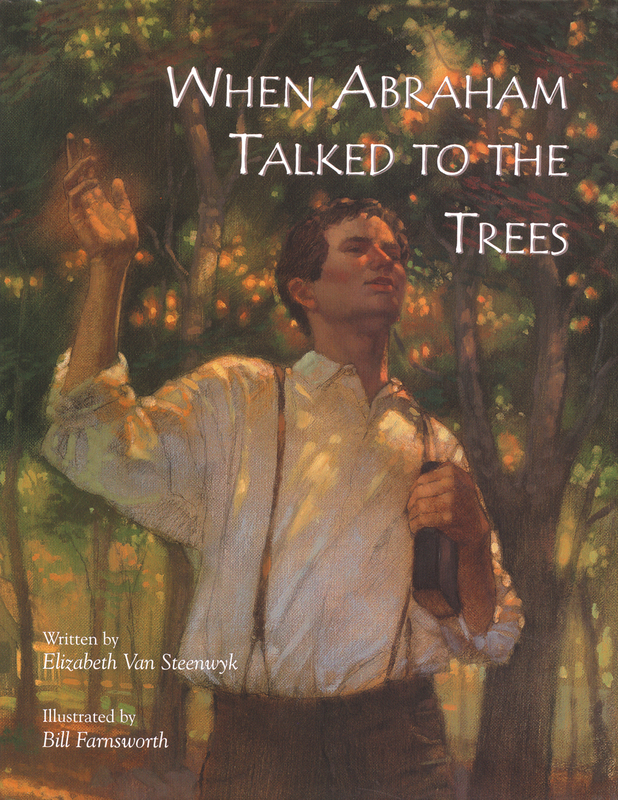 When Abraham Talked to the Trees, by Elizabeth Van Steenwyk, illustrated by Bill Farnsworth. Eerdman’s Books for Young Readers, Grand Rapids, Michigan, 20 00. Ages 5 and up. Many children will identify with Abraham’s struggle learning to read: he didn’t even have a teacher. As the author points out “school was a sometime thing.” When young Abraham memorizes Aesop’s fables his family listens to his recitations with rapt attention. But when they inevitably wander off, the young man continues, speaking to the trees, practicing the skill of oration that would serve him well during America’s troubled times. I had the opportunity last spring to visit Lincoln’s library and museum in Springfield, Illinois. There is a life-sized room there, much like the one pictured in this book, depicting a young Abraham Lincoln reading into the wee hours of the night. His determination to read and later to speak with conviction was nurtured in these humble beginnings. This book can be a vehicle to inspire the child who yearns to accomplish something difficult. The goal may not be President. It may be as life-changing as learning to read. And Abraham struggling by candlelight can show the way.